The HP Spectre x360 is a flagship laptop lineup from HP that always comes with unique designs and features. The late 2017 and 2018 model have a great looking designed and more lightweight than before. It has an outstanding performance, a great keyboard and trackpad, a choice of a clear FHD or 4K display, and Bang & Olufsen quad speakers. This premium laptop can be better with a right set of companion accessories that can protect and improve your productivity and entertainment. Today we’ll list down all our best-picked accessories specifically for the HP Spectre x360 13t. Designed for HP Spectre x360 2016 or later with precise cut and fit. HD Clear gives the better display for your eye. Protect your laptop screen from scratches and dust. Easy to install with self-adhering and no residue leaves when remove. Comes with 2-pieces of the screen protector and a set of installation material. Available in 2 versions: Anti-Glare and HD Clear. The laptop screen is the most important and easy to break part of every laptop especially for such premium ultrabook like the HP Spectre x360 13t. The best way to protect it is to apply a screen protector to prevent scratches and accidental impact on your laptop’s screen. This CaseBuy screen protector is made to precisely fit your HP Spectre x360 13t and it does its job very well. The HD Clear version gives you the best looking through while the anti-glare one will reduce reflection when you work outdoor and bright condition. It also comes with 2-pieces of the screen protector in case you messed up with your first-time screen protector installation. Designed for HP Spectre x360 13t 2018/2017. Made of premium grade TPU with the durable and lightweight material. Ultra-thin at 0.13mm minimize typing interference. Protect your laptop from spills, dust, liquid, and key wear. The laptop keyboard is also a critical part of laptop you need to care about as well. It can be broken or unresponsive when it’s filled with dust or any liquid over time. To settle this problem, you will need to apply a keyboard skin cover to take care of that. This CaseBuy ultra-thin keyboard cover is designed specifically for the HP Spectre x360 13.3-inch 13t featuring an amazing 0.13mm thickness. It is also high transparency and together will minimize the typing interference at most. It’s also easy to install and remove. And, to wash the cover, you will need only soapy water. Perfect protection for HP Spectre x360 13t. The HP Spectre x360 is a kind of lightweight ultrabook and you might don’t want to add any bulk or weight to it for just protection or transportation. 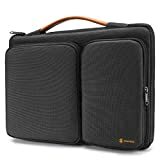 This slim briefcase from Tomtoc features a minimalistic design while having enough space for your laptop’s accessories. It has its own patented CornerArmor™ technology which is designed to give an excellent in protecting your laptop in any accidents. Flatten to power down & snap into curved to power on. Bluetooth 4.0 LE with BlueTrack technology. Support horizontal and vertical scrolling with full scroll plane. Available in light grey, black, burgundy, and cobalt blue. You might look for a premium highly portable mouse to stay with your laptop wherever you go and work. This Surface Arc Mouse is the perfect companion for your HP Spectre x360 13t with Windows 10 installed. It comes in multiple colors in which will curtain match your laptop’s color. 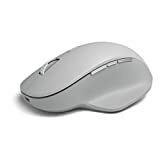 The Surface Arc Mouse uses Bluetooth 4.0 wireless connectivity that will work seamlessly with your laptop. It uses BlueTrack technology that will work almost any surface. It now comes with a full scroll plane which allows you to scroll both in both vertically and horizontally. The super thin design of the HP Spectre x360 needs a sacrificed of port selection. It has no full-size USB ports, common video output ports, ethernet ports and SD card slot that most users still rely on to get their job done. 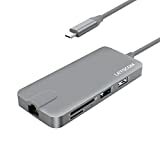 If you want an adapter that is lightweight and takes care all connectivities, this Letscom 8-in-1 Type-C hub is an excellent choice. This single adapter has a Gigabit Ethernet, a USB-C charging port, 2 USB 3.0 ports, a USB 2.0 port, a 4K HDMI port, an SD slot, and a TF card slot. 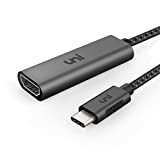 It is a good idea to carry a USB-C to HDMI adapter when you need to do a presentation at school or at work. In that case, the uni USB-C to HDMI adapter is highly portable, strong, and easy to plug and unplug. It supports HDMI 2.0 and HDCP 2.2 which allows you enjoy the highest output quality of 4K@60Hz without any lag. The cable features a user-friendly design with non-slip connector design, fits snugly, and made of aluminum alloy for better heat insulation and lasts longer. The cable is also shielded with braided nylon for extra strength and durability as well. Safety guarantee with certifications and protection technologies. In case you lost or need extra power adapters for your HP Spectre x360 13t so you can charge your laptop either at home or office without carrying it around. This Nekteck USB-C PD wall charger features 65 W power output just the same as your laptop’s power adapter. It is certified by USB IF with TID of 1022060 to pass a set of the test by USB compliance standard. It has a power ranged of 20V/3.5A, 15V/3A, 9V/3A, and 5V/3A. It has all safety technology such as over-charging, over current, and overheating protection. Click here for more information about USB IF certified power bricks. Are you a student or freelancer who prefer working continuously no matter whenever or wherever you are? Then it is the great idea to carry a portable power bank that capable of charging your both laptop and phone on the go. 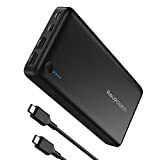 This RAVPower USB C Power Bank features a large battery capacity of 26,800 mAh. It can be recharged with either both fast Type-C port or 2A or 1A micro USB port. It can output up to 30W Power Delivery over Type-C port with a power ranged of 20V/1.5A, 15V/2A, 9V/2A, and 5V/3A. Even it’s not quite powerful as it’s original power adapter, it is powerful enough to power up your laptop when it is under normal load or in sleep mode. Are you frequently out on the road traveling back and forth between places with your laptop? Then it is also a good idea to power up your laptop and devices while you’re in the car. 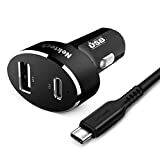 This Nekteck USB-C car charger features 45 W power output that powerful enough to fairly fast charge your laptop. It is certified by USB IF with TID of 1000081 to pass a set of the test by USB compliance standard. It has a power ranged of 20V/2.25A, 15V/3A, 9V/3A, and 5V/3A. It also comes with additional standard USB-A port for charging your phones, tablets, and other USB devices with power up to 12W. It has all safety technology such as over-charging, over current, and overheating protection. Do you want to play games on your HP Spectre x360 13t? It’s obvious that you can’t play AAA games at high settings as it isn’t built for gaming, but most titles are still playable on low settings. Most games allow you to play with either keyboard and mouse or joystick. The best productivity mouse that can bring all favorite commands in Windows 10 right to your fingers. It features a built-in rechargeable battery, multiple device connections, three additional customization buttons, and more. Project to any HDMI enabled display wirelessly with this Wi-Fi CERTIFIED™ Miracast® technology made by Microsoft. It works perfectly with all recent laptop running Windows 10. Connect your laptop to external monitor or projector with this USB-C to VGA adapter that supports resolution up to 1080p@60Hz. It is easy to install, no drivers or power adapter needed. If you don't have an account on our forums, you can use this comments section to share your issues, solutions, or any ideas related to the “Best HP Spectre x360 13t Accessories for 2019” topic.